This is the April 1993 issue of Ellery Queen's Mystery Magazine which contains the first publication of the short story "First Lead Gasser" by Tony Hillerman beginning on page 4. Hillerman's story is a fictionalized account based on a death row execution that he witnessed while working as the New Mexico manager of the United Press. 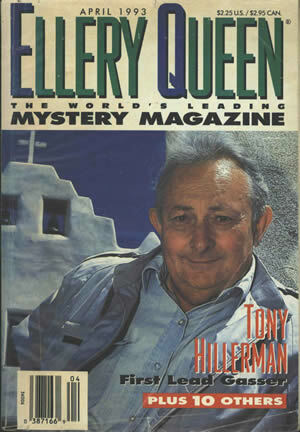 This is a paper serial with a full-color photo cover of Tony Hillerman taken by Barney Hillerman. Binding: Full-color paper covers. The spine is white and on it is printed "ELLERY QUEEN'S MYSTERY MAGAZINE ® APRIL 1993" in black.